You’re looking to install a fence in your yard this year, but do you know what type of material you’ll choose? Fencing comes in a variety of materials, and its up to you to pick the one that is best for your lifestyle. Do you want something that is strong, but requires little maintenance? Vinyl fencing might be the choice for you. Take a look at the many benefits of installing a vinyl fence, brought to you by Freedom Fence & Home. Strength. Did you know that vinyl is almost five times as strong as wood? It can withstand heat, cold, wind, rain, and even salt. You’ll have no problem keeping a vinyl fence stable when trying to keep your pets in, and unwelcome visitors out. Little maintenance. Vinyl fencing comes in a variety of different finishes, and unlike paint, it will not chip and does not need to be repainted. Vinyl also will not rust, so basically the only upkeep required is a wipe down with soap and water. Environmentally friendly. Vinyl is a recycled material! It is also not treated with any harmful chemicals, making it non-toxic. Price. Because upkeep is easy and can be done on your own, you won’t have to worry about any extra maintenance fees. Installation is also simple, and vinyl is much cheaper than a fence made of wood or iron. 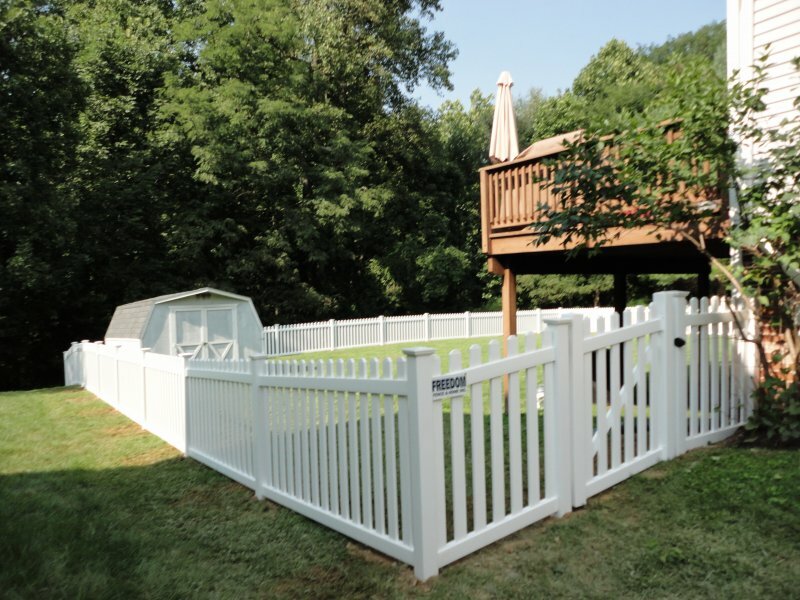 If you’re still not sure that vinyl fencing is the right choice for you, please feel free to call Freedom Fence & Home Inc. at (443) 271-6841. We’d be happy to help you out with your fencing installation, whether it is vinyl, wood, chain-link, aluminum or steel. You can also contact us by visiting our website. This entry was posted on Wednesday, November 6th, 2013	at 5:53 pm	. Both comments and pings are currently closed.